The PC community joined together on May 18 for one last drive down Huxley Avenue. The street will be closed to automobile traffic and serve as a pedestrian walkway that unites upper and lower campus. Say farewell. MARK YOUR CALENDARS… … We’re going rafting! Need a break from adulting? We’ve got you covered. Check out this all-inclusive weekend of whitewater rafting, just for FOLD! HAVE YOU SEEN THIS? FOLD is on the web! Visit the new FOLD website to access photos, events, and of course, future editions of The FOLD Feed. P.S. let’s connect on Twitter: @PC_FOLD? GIVE IT A READ. Are you drinking the millennial Kool-Aid? We may be the economy’s youngest workers – but we have a lot to offer. Check out Fortune’s article on what corporate America has to learn from us. 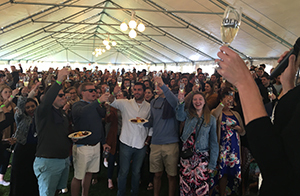 The Class of 2016 raised their glasses on April 29th during their Done with College celebration as Monica Incantalupo ’07 officially welcomed them into the alumni network at the second annual Welcome to the FOLD Champagne Toast. Welcome to the FOLD 2016, we’re happy to have you! Click here to learn more about the Class of 2016 Ambassadors.